The Trump administration is slapping more sanctions on Russian officials and entities for election interference and what the Treasury Department calls other "malign activities." 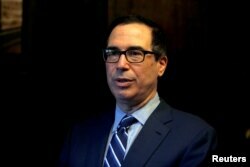 "The United States will continue to work with international allies and partners to take their collective action to deter and defend against sustained malign activity by Russia, its proxies, and intelligence agencies," Treasury Secretary Steven Mnuchin said Wednesday. FILE - U.S. Treasury Secretary Steven Mnuchin speaks during his interview with Reuters in Jerusalem, Oct. 21, 2018. Treasury said the Trump administration has so far sanctioned 272 Russians and entities for "a broad range of malign activities."